April is BECQ’s Environmental Awareness Month. We hold activities and events all month leading up to Earth Day, which is celebrated internationally on April 22nd. 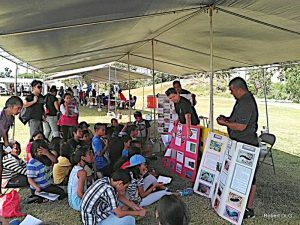 A team favorite is the Environmental Expo, an interactive station-based fair for 4th grade students held on both Saipan and Rota. We love to roll up our sleeves, teach students about our work with hands-on activities, and answer questions.